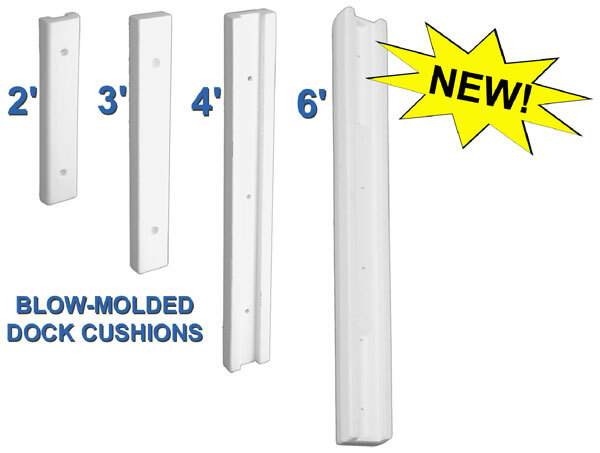 Den Hartog Industries is excited to expand their Blow-Molded Dock Cushion Line. Along with the 2-foot, 3-foot & 4-foot lengths, these cushions will now also be offered in a 6-foot length! These blow molded dock cushions are designed to be installed either vertically or horizontally on boat dock structures. They are intended for the protection of watercraft when in the a dock area. Ace Dock Accessories Blow-Molded Dock Cushions are available in a variety of mounting back options for added installation flexibility. Made from high-density polyethylene with U.V. inhibitors. 6-foot Blow-Molded Dock Cushions are available in flat, 2.00″ groove, 2.50″ groove and 3.50″ groove styles. To view product specifications please visit our Blow-Molded Dock Cushions page. You can also view other Dock Cushion options on our Roto-Molded Dock Cushions page.